Meet Dan the dove huntin’ man! Dan Bahlau, kneeling, center, and his 2018 hunting group from Ruben Hunts in Brownsville, Texas. 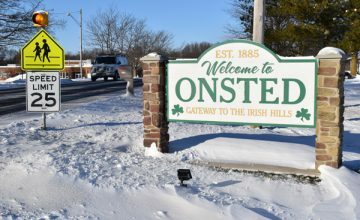 Hunting for wildlife in Michigan can be done year round. Naturally, there is deer hunting season from October to January, which is enjoyed by millions of folks. Then there is squirrel, rabbit, pheasant, quail, grouse, goose and duck hunting in the fall. Squirrel season continues in January and February along with rabbit, and then we have turkey hunting in the spring and fall as well. Coyote hunting can be done year round, but not everybody hunts coyote. If you’re lucky, your name can be drawn for bear and elk as well, but there are no guarantees you’ll get to hunt that year. Michigan has much to offer when it comes to hunting, but there seems to be a lull when it comes to hunting in late summer. Let’s say it’s mid-to-late August, and you want to plan on going on a vacation/hunting trip somewhere, where would you go? You could always find one of those exotic hunting trips outside the country, but those can be quite pricey, especially for big game animals. And, there is no guarantee you’ll get anything, even with a guide. What if you could go on a hunt where you don’t need any special guns or equipment, there would be about a 90 percent chance you would harvest game, and it was a quarter of the price of those big game hunts?! I’m talking about white-winged dove hunting, and recently I spoke with longtime area resident Dan Bahlau about a hunt he went on back in October. Dan has been going for many years because he enjoys it so much. It all started over 20 years ago when he won an auction for white-wing dove hunting at the Golden Nugget for a hunting trip down in Mexico. 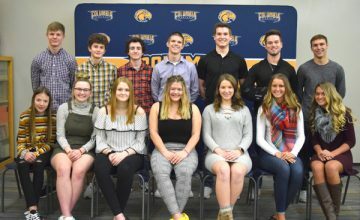 It was sponsored at that time by the Rocky Mountain Elk Foundation, which is similar to a Ducks Unlimited, where the proceeds benefit wildlife. Now, before we get into Dan’s story, let me tell you a little about white-winged doves. White-winged Doves are a native bird that live in the south-western part of the United States, Mexico, Central America and all the way done to the Caribbean islands such as Cuba. They are similar looking to mourning doves, but have a white stripe on their wings, hence the name. Recently, due to the ability to adapt to living in urban cities and benefitting from people’s bird feeders, their numbers and range have expanded into Texas, Oklahoma, Louisiana, and Mississippi. They are about 12 inches long and weigh about 5½ ounces. These birds like to live in desserts, as well as dense, thorny woods alongside streams. They like to feed on agricultural crops such as corn and wheat, panic grass, bristlegrass, fruit, and Mexican jumping beans. They’ll usually have one to two broods a year consisting of one to two chicks. Where can you get a copy of the exponent? Click Here! The state of Texas started selling dove stamps in 1971 and this has created millions of dollars for white-wing dove conservation. They often fly in flocks of thousands, and Mexico offers tremendous opportunities for hunters here in the United States. Dan recently hunted for three days in October of last year. He was joined by his cousin Gary Wolcott, who used to live in Brooklyn but now lives in Atlanta, Georgia, along with Gary’s hunting buddy named Justin. Dan booked a flight from a professional guide down in Mexico and flew into Brownsville, Texas, and then he and his party took a van to a hunting lodge across the border in San Fernando Valley, Mexico. The moment they arrived at the lodge, which is more like a resort with a pool and everything is included, the boys were greeted with margaritas as well as an open bar, although Dan does not indulge in such things himself. The lodge offers both American and Mexican foods such as steak, chicken, nachos, and homemade tortillas. Dan mentioned that he also got to dine on wild game such as rattlesnake, white-winged dove wrapped in bacon, and Javelina. Javelina is also known as peccary, they are not pigs, but look similar and are native to the area and are hooved mammals that weigh around 35 to 60 pounds. Dan, Gary, and Justin ate heartily that night and looked forward to the next days’ hunt. The boys were picked up bright and early before dawn by a van and taken to separate areas alongside a wooded stream. Their “stand” consisted of a five-gallon bucket that you could sit on, which also served as a fridge for cold beverages, as the weather hovered around 90 degrees. The lodge supplied them with 20 gauge shotguns and they waited for the birds to fly overhead. 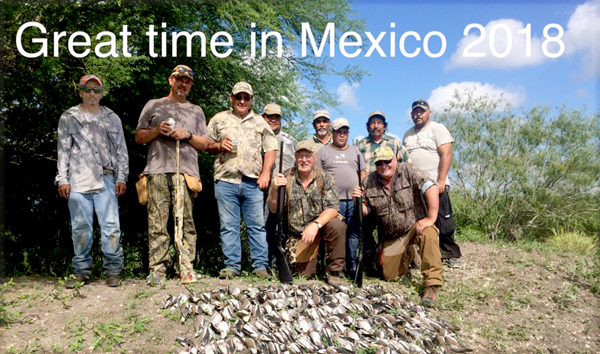 Each hunter also was assisted with local Mexican “bird boys” that would retrieve and clean the birds after the hunter bagged each dove. Dan said where they had the most success was around 10:30 to 11:30 a.m. and then again between 5 to 6 p.m. The hunters were picked up throughout the day so they could enjoy lunch and dinner. I asked Dan what it was like, and he stated, “It was a fun group, so even though we were 100 yards apart, if we wanted to we could join one of the other hunters.” Dan went on to say “the more the merrier,” and after each hunt, the hunters would share their stories. Dan told me one guy was shooting so fast on one hunt he caught his thumb in the shotgun while shooting. Another guy actually fell into some cacti, but he just kept shooting because there were so many doves to shoot. The bird boys then pulled the cacti spines out of him afterward! Due to the huge population of the white-winged doves, they were very successful. Dan went through 73 boxes of shells during his three days of hunting and along with Gary and Justin, they enjoyed their fresh dove at dinner that night. Although it seems like they are shooting a lot of doves, keep in mind that there are other benefits to these types of hunts. It keeps the dove numbers in check so the birds do not starve by overpopulation, and many of the doves that are shot are actually given to the bird boys and their family, who often are poor and benefit from all that extra wild game. It’s a win-win for both the hunters and the locals. Dan and his party booked their hunts through Ruben Hunts, which is owned by Rueben Caballero. Caballero has been guiding hunting and fishing trips for over 20 years. If you’re interested in going on one of these hunts, you can check out their website at http://rubenhunts.com/ to obtain more information. 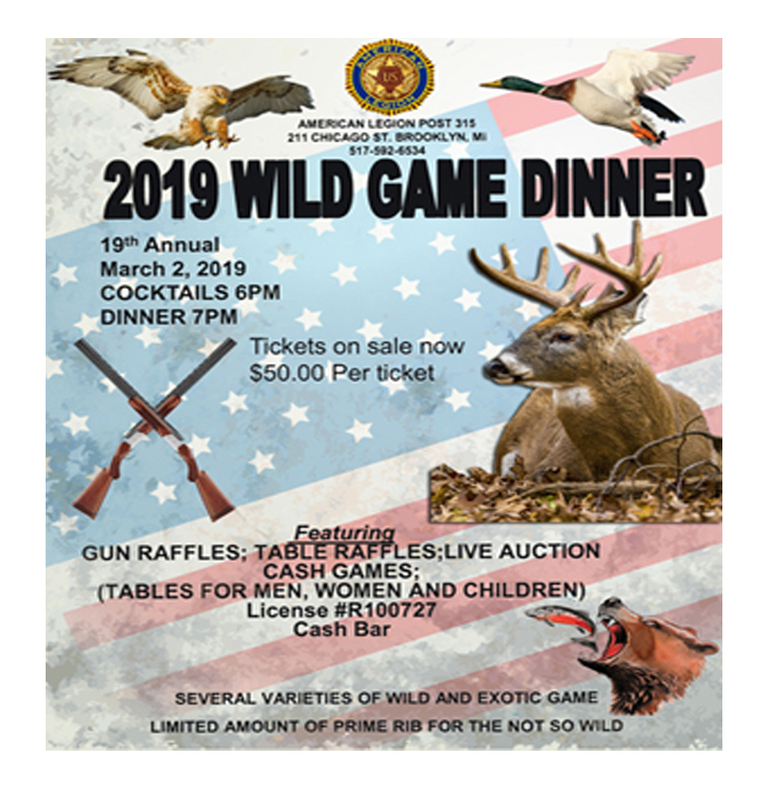 So, if you’re looking for a hunting adventure where everything is included, it’s much cheaper than those big game hunts and you help out the local people, now you know. Incidentally, Dan had so much fun that by the time you read this, he will be back in Mexico for another hunting adventure. This time he will hunt waterfowl and mourning doves. One thing is for sure, it will be a lot of fun! And I’ll bet it’ll be a wee bit warmer down there than in Michigan.